Recently, NW Design Guild had the pleasure of designing and handcrafting Salon, Master and V Berth cushions for a 50 ft. sailboat designed by William Garden. Docked at the Shilshole Bay Marina in Ballard, the vessel is entirely crafted from teak wood and recently underwent a five-year renovation process in order to provide for smooth-sailing, restore its original character, and update the interior with a retro-feel per the owners’ liking. The Master Berth gets a new latex cushion with a chenille-tufted cover. The Main Salon, across from the Master Berth, has the same chenille covers. The complex angles in the boat’s construction are hardly noticeable when the cushions are cut correctly. Like the Main Salon, the V Berth required custom cut cushions, due to the complex angles that are typically found in a sailboat. The firm foam cushions were covered in a durable, kiwi-green chenille. What made the project particularly unique is the history behind the design and construction of the sailboat itself. Although constructed in Hong Kong at Cheoy Lee Shipyard Ltd. in 1963, it was designed by local, Seattle-favorite William Garden whose detailed biography and design history can be found on the Mystic Seaport website: www.mysticseaport.org. 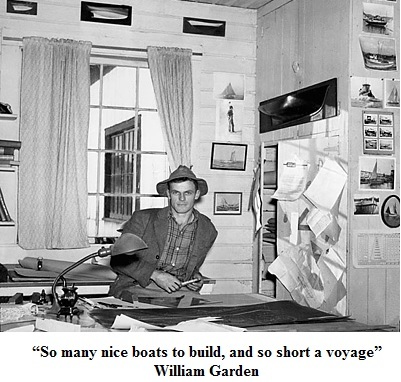 To provide a brief background, William Garden moved from Canada to Seattle with his family at the age of ten and spent his summers boating with friends on Lake Union and the Port Madison waterfront. After graduating from high school, he attended the Edison Boatbuilding School of Seattle and began building sail boats and power vessels with Andrew’s Boat Company on Portage Bay. 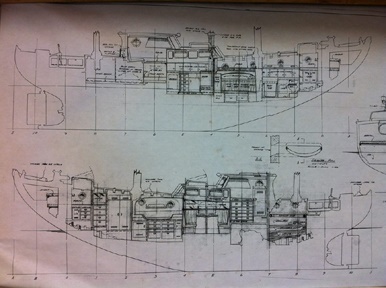 By the age of 24 Garden had already designed 51 work boats, tugs, trollers and sardine boats. Garden later formed his own company in the 1940’s in Ballard. Soon after he was drafted into the US Army during World War II and sent to the Adak Ship Repair Base in the Aleutians. When later asked about the experience, he was quoted saying, “I was the only man in the Army employed in what I liked doing.” After being discharged from the army as a Master Sergeant, he quickly became a licensed naval architect and returned to Seattle to design fishing boats, work boats, pile drivers and yachts– his largest measuring 236 feet in length. Today, hundreds of Gardens’ boats can still be seen sailing all over the world and in Seattle, where the designer began his career.